The East and West Side of Town. Written by Norton Atkins. Composed by Felix McGlennon. The East side and the West side have their manners and their fashion�We'll take a little glance at each as through the town we dash on. And here's a hash-house where you'll find the bill-of-fare much thinner. "Aw, waiter, brwing some sherwy here!" that's West side. Young feller give us schooner beer!" that's East side. Nice quail on toast before the guest they place When one dines in the West. With pork and beans they change the scenes down East side. 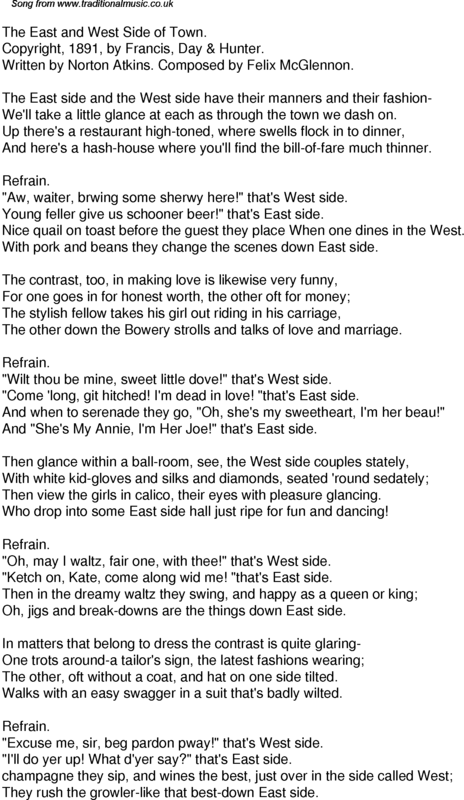 The other down the Bowery strolls and talks of love and marriage. "Wilt thou be mine, sweet little dove!" that's West side. "Come 'long, git hitched! I'm dead in love! "that's East side. And when to serenade they go, "Oh, she's my sweetheart, I'm her beau!" And "She's My Annie, I'm Her Joe!" that's East side. Then view the girls in calico, their eyes with pleasure glancing. Who drop into some East side hall just ripe for fun and dancing! "Oh, may I waltz, fair one, with thee!" that's West side. "Ketch on, Kate, come along wid me! "that's East side. Oh, jigs and break-downs are the things down East side. The other, oft without a coat, and hat on one side tilted. Walks with an easy swagger in a suit that's badly wilted. "Excuse me, sir, beg pardon pway!" that's West side. "I'll do yer up! What d'yer say?" that's East side. They rush the growler-like that best-down East side.